I am not sure why but a red plaid pattern evokes thoughts of Christmas for me. 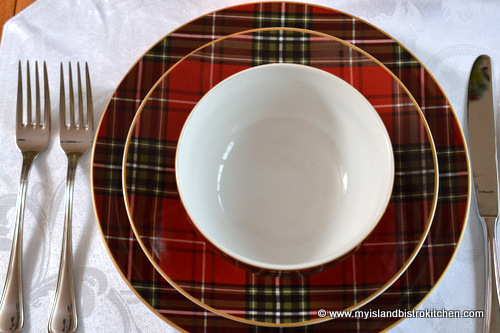 As I have discovered, red tartan dishes lend themselves well to setting a beautiful holiday table. The dishes I have chosen for a holiday dinner are by designers Colin + Justin. Apart from the dynamic look, there are several things I like about this dinnerware pattern. First, the dinnerware has the look and feel of fine china, complete with gold-colored trim, but is actually easier to care for since the dishes are both dishwasher and microwave safe. 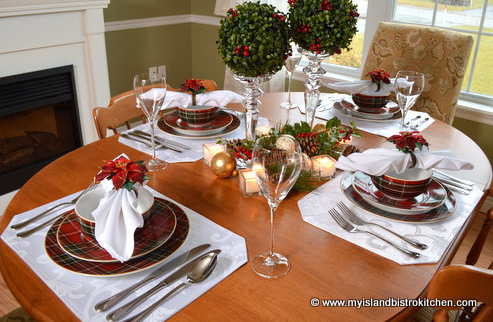 Second, they can work effectively either in a formal or informal tablesetting. In fact, I’d suggest they are quite contemporary in look and design and could easily transition from breakfast/brunch to lunch to dinner. And, third, they don’t scream Christmas which means they can be used throughout the fall and winter months. With their dark color, they would be a bit heavy for spring and summer, in my view, but I would certainly use them from October to March. The dinner plate has a white center so food will still stand out against the plate. I’m a big fan of white plates for food presentation! 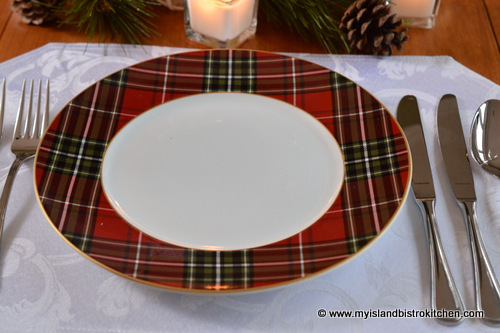 This dinnerware gives the benefit of a nice plaid border against the white center. The salad plate is a full tartan design. 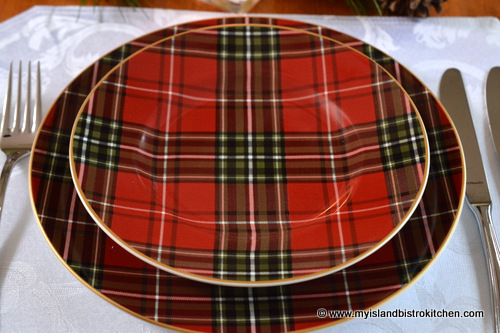 The dinnerware has the versatility of allowing for an exchange of a plain red, green, or white plate with the plaid salad plate for added contrast to the setting or to change it up for different occasions. The bowl is white inside so the soup color certainly stands out. 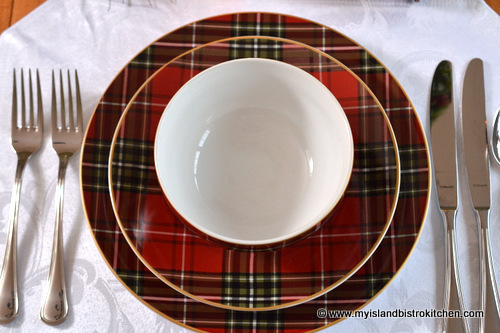 The dinnerware with its bright red and green plaid has a somewhat heavy look to it so it needs some bright white neutral contrast on the table for it to stand out. 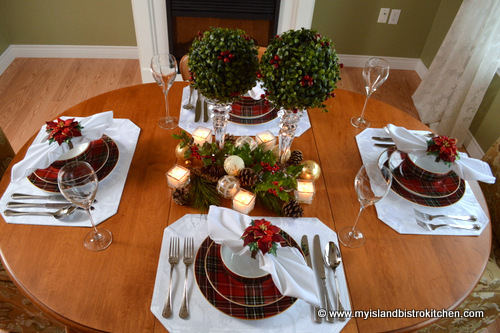 For this reason, I have chosen to use large plain white placemats as the base for each place setting. The white connects to the center of the dinner plates and bowls – always try to connect the linens somehow to the dinnerware pattern. If, for example, I had chosen red or green placemats or a full tablecloth in either of these heavier colors, the dinnerware pattern would have been lost and would not have stood out. And, sometimes, I just want to see the maple wood in my table and placemats allow for that. The placemats are also in keeping with the contemporary look of this setting. 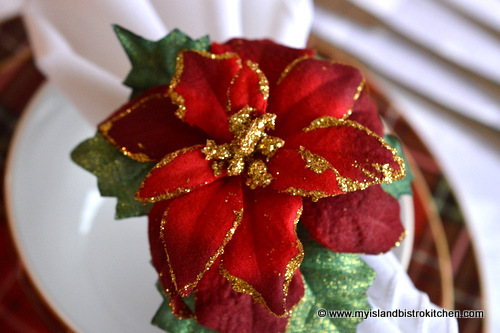 If you are not knacky with napkin folding, or simply don’t have time, using napkin rings is an easy alternative solution. I think of napkin rings as the jewelry on the table. 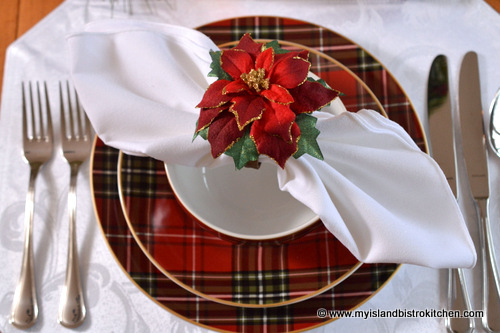 I bought these beautiful poincettia napkin rings on an after-Christmas sale last year and think they go particularly well with this dinnerware. With their deep red color, they need a bright white napkin for their color to pop. The white napkin, of course, connects to the white placemat. 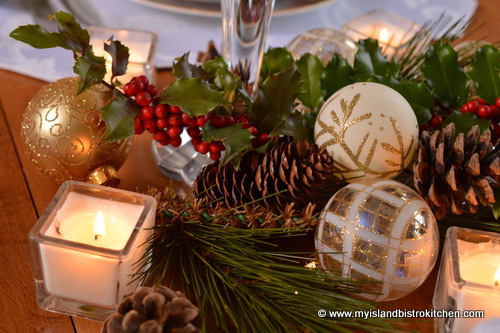 Apart from the speed and ease of threading a napkin through a ring, napkin ring-folded napkins can be placed in various locations at a placesetting — to the left-hand side beside the fork, in front of the plate if space allows, or laid across the plate or atop a soupbowl (as I have done in this setting) if table space is at a premium or you simply want to add some pizzazz to the top of a placesetting. For the tablescape, I pulled in colors from the dinnerware. 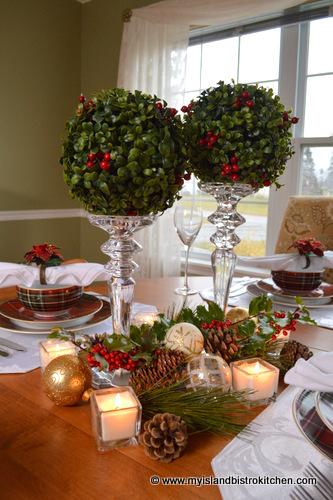 I have opted for a relatively simple and easy-to-construct centerpiece – two faux green kissing (or pomander) balls on high glass pillar candlesticks surrounded by greenery, holly berries from outside my front door, Christmas balls, and pinecones to fill in some empty spaces. 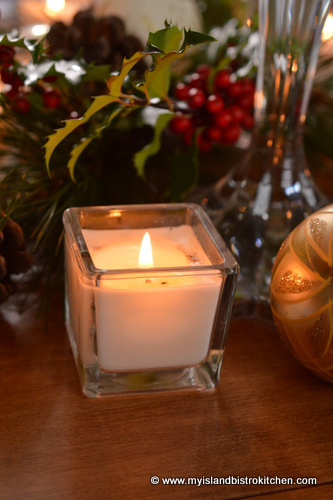 Since I am not a huge fan of taper candles that can easily tip with a guest’s knee jerk against the table, I have chosen to use a series of small white votives interspersed along the edges of the centerpiece. 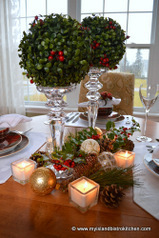 They add a lovely upward glow to the kissing balls which are the focal point of the tablescape. 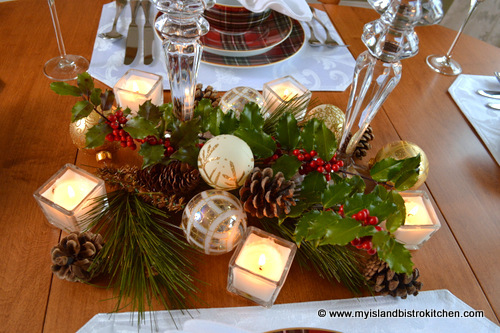 One of the things I am doing this season in my tablesettings is trying to use existing product and props in my centerpieces as opposed to buying more or always opting to use fresh flowers. As lovely as fresh flowers are, they do require some work and, if I want to set my table well ahead of an event as my time allows, it’s easier if I use other options for centerpieces. Additionally, if you already have suitable props, it’s a more economical option. Because this dinnerware is quite modern, I am using extra-tall and very contemporary wine glasses. 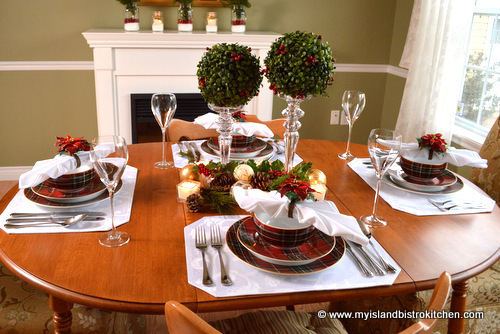 The height of the glasses complements the high centerpiece as well as the dinnerware. 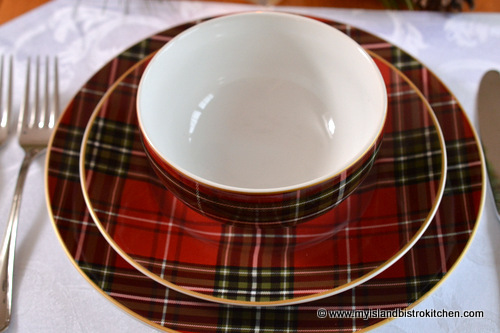 I hope you have enjoyed my contemporary tablesetting using red tartan dinnerware. Happy Holidays!